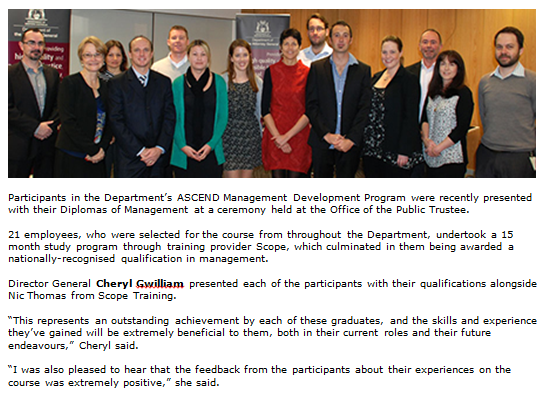 Scope Training took over a project to deliver the Diploma of Management to select staff at the Department of Attorney General as part of their internal ASCEND program. Scope Training lecturers delivered units of competency within their respective fields. The program was delivered over a year culminating in a formal graduation attended by some of the participants, the Director General and Nic Thomas who delivered the last module of the program. Overall the course was well received with great feedback from the participants.